This is the original Rainbow Riches slot by Barcrest that all the others have been based around, it's an all time favourite amongst players in uk bingo halls, amusement arcades and bookies. 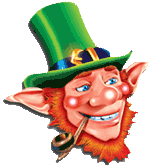 The wishing wells, pots and leprechaun feature are catchy, colourful, fun and can be very generous making it a classic machine for years to come. It started life as an S16 slot which was £2 play and £500 jackpot, then after the change of uk gambling laws in the late 90's it was changed to a Cat b3 which meant it had to be lowered to £1 stake. Then again in 2011 the government again changed the laws and it's now available on stakes from 25p to £2 all for a £500 jackpot on the standalone cabinet or the the newer 777 cabinet with the added gamble feature. It's now available to play online or on on your mobile for real money at stakes of anything from 1p to £400 for massive jackpots! Sky Vegas were the first online casino to introduce the classic Rainbow Riches slot into the online world of slots, you can join sky now for some great promotions to get free credits to play for real! Don't forget you can play our very own Rainbow Riches emulator completely free with no download required.